Find out more about Candice on her food blog at www.thegorgeousgourmet.co.za. Heat 10g (1 tbsp) of the butter in a large non-stick frying pan and fry the bacon and leeks until the bacon is crispand the leeks are soft. Melt the remaining butter in a small saucepan and add the flour. Whisk until well combined. Slowly add themilk, whisking continuously. Bring to a boil (still stirring), reduce the heat and simmer until it starts to thicken. Add the grated Cheddar to the white sauce and continue to whisk.Season well. 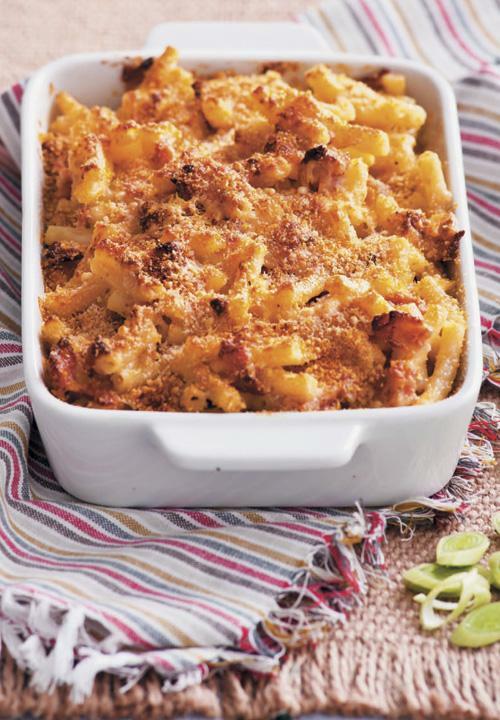 Combine the drained pasta, bacon and leeks and cheese sauce, and mix well. Pour into an ovenproof dish, topwith grated pecorino, followed by the breadcrumbs.